Downtown Spokane is, unquestionably, the most desirable place to live in the city. Between one of the nation’s most beautiful urban parks, our region’s highest Walkscores, stellar transit access, and excellent dining, shopping, and entertainment, it’s not surprising that people want to live in the core. And in recent years, rental and ownership prices for downtown- or downtown-adjacent housing has reflected this reality. At Kendall Yards, you’d be hard-pressed to lease a one-bedroom apartment for less than $1,200, and the lowest-cost ownership unit in the district right now will run $320,000. At the (beautiful) Chronicle in the the downtown core, one-bedroom units can fetch about $1,300. In the hospital district, a (smaller) one-bedroom in the recently-renovated Cooper George rents for $1,125. In 2015, the luxury Michael Building, which contains 18 units, was renting at $1,800/month. Next door, the high-design Mystery Lofts start at $2,400. It’s expected that The M will rent somewhere in the mid-range of these examples. Now, much of this pricing phenomenon can be attributed to the simple fact of pent-up demand for downtown living and limited inventory. Even after a decade of economic recovery, developers seem reluctant to undertake the types of big projects in downtown Spokane which are currently sweeping cities like Seattle and Portland. Instead, they’re taking on smaller, remodel-focused, and upmarket projects in the core. Social services providers, meanwhile, have recently opened Buder Haven, the Marilee, and an expansion of Fr. Bach Haven. Thanks primarily to the indomitable patience of Ron Wells, the Ridpath will reopen soon as microunits aimed at low- to moderate-income residents. But even with these “affordable” housing projects, we’re still left with a significant hole in the middle of the market. Middle-income families, public servants (like teachers and nurses), and those in contract work––generally all those who hover around the area’s median income, even if they wanted to, still aren’t really able to live downtown. That’s wrong. Everyone should be able to live in downtown Spokane. The core of our city is meant to be a place where diverse groups can come together and experience community in a profound and fundamental way. It’s meant to be a place where we can learn from each other, share, and deepen our shared understanding of the world. In Spokane, it’s uniquely a place where we can come together to reconnect with the land, and better recognize and remember our relationship to the peoples who gathered around the Falls for centuries before we arrived. These experiences are public goods which everyone should be able to experience, and they’re unique to downtown. So let’s explore ways to make downtown more accessible to the middle and working classes. We already have a tax exemption for some new multifamily development. Let’s introduce generous density bonuses and other incentives downtown and in Centers and Corridors (i.e. North Monroe, Hamilton, East Sprague, etc.) for private developers who elect to include workforce housing in their new-build projects. Let’s build strict workforce housing requirements into sales of surplus City and County property. Let’s lobby the State Legislature for robust reform of the Washington Condominium Act, which makes multifamily ownership development in this state prohibitively expensive and limits the ability of urban dwellers to enter the property ladder. Let’s explore a community land trust to build more long-term naturally affordable housing. Let’s utilize the City’s own assets and unique municipal bonding authority to build social housing, publicly-owned downtown units which would be open and accessible to all, without precondition. (Fun fact: 60% of Vienna’s residents live in social housing.) Let’s mandate housing affordability––a certain percentage of all new housing developments downtown should be set aside for workforce housing. Let’s work with affordable housing advocates and consumer groups to develop, support, and encourage new ownership models, such as co-ops and memberships, which allow renters to gradually develop an ownership stake “nest egg” in their building or unit. And yes, as the City Council weighs significantly relaxing development regulations along Spokane Falls Boulevard, let’s consider mandating workforce housing (up to, say, 80% of the area median income) in projects which take advantage of the new rules. If we can seriously consider some of these ideas, and work carefully to make downtown living more financially and socially accessible, our city will truly become a better place for all. SHARE YOUR THOUGHTS: What do you think? 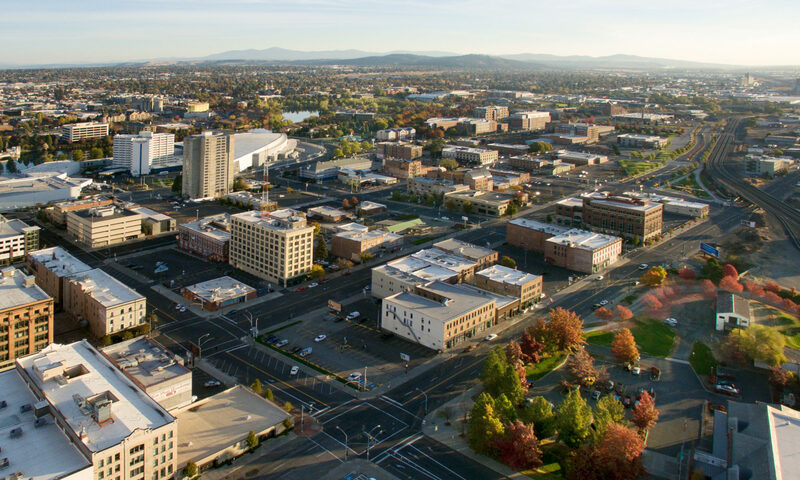 Is downtown Spokane accessible to the middle class? Do you think we need to do more to make sure people from all walks of life can live downtown? Is there a “missing middle” of the market which private developers aren’t addressing? Share your thoughts in person, on Facebook, on Twitter, or in the comments below. We love to hear from you! Next PostNext Will we learn old lessons as we study parking downtown?